There are so many great non-fiction picture books coming out and I wanted to share another one. I’ve always been intrigued by ALVIN and the idea of diving into the deep sea! So interesting and fun to read about. Experience a day in the life of an Alvin pilot and join scientists at the seafloor to collect samples and conduct research. Along the way, discover what one wears, eats, and talks about during a typical eight-hour trip in a underwater craft and find out more about the animals that live deep in our oceans. Extensive back matter explains how Alvin works, describes the author’s research, and includes a glossary and further reading.. 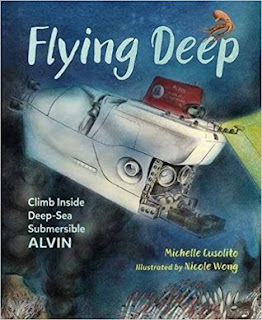 Flying Deep: Climb Inside Deep-Sea Submersible ALVIN, written by Michelle Cusolito and illustrated by Nicole Wong, was published in 2018 by Charlesbridge. This book starts with a mission to explore the deep sea. From there, the rhythm of the language is almost like waves as the experience of being inside ALVIN unfolds. Beautiful, soft illustrations compliment the sensory details of the ALVIN trip, making the whole book an undersea experience. Imagine you’re the pilot of Alvin, a deep-sea submersible barely big enough for three. I loved the way the text is sprinkled with questions that invite the reader to share their own ideas and thoughts. It was interesting that time stamps were included to give a clear picture of how long the journey took. This would make a great read aloud, especially if time is given for students to observe and discuss the details in the illustrations. At the end of the book, there are interesting notes from the author and the illustrator about the process of researching information for the book, as well as glossary and cool facts about a few of the organisms that live down deep. Question: Did anything surprise you about the ALVIN? Deep sea life? Write one question the book doesn’t answer. Imagine and Draw: Imagine you’re a deep see architect or engineer. What could you build for scientists or people to use underwater? What would it look like? How would it work? Draw and write about your structure. Research: Which organism from the book would you like to learn more about? Do some research and make a mini-poster to display what you found out. I missed this because you posted it when I was on vacation in Alaska. Thank you so much, Andrea. Your book is beautiful, Michelle. I was so happy to have a chance to feature it on my blog.